Get yourself on the map! 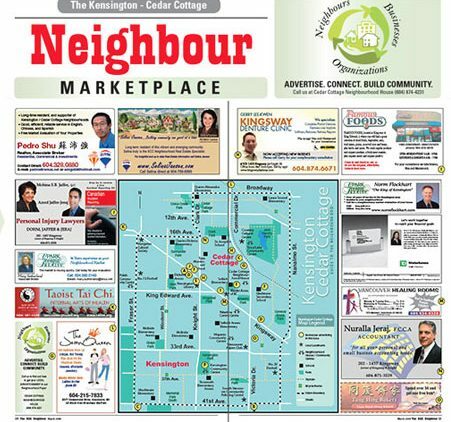 Help support our community by advertising in the KCC Neighbour, Kensington/Cedar Cottage's new community newspaper. These ads are located in the centre spread - a functionable pull-out section featuring a map of the community (Kensington/Cedar Cottage). With your ad, the location of your business is also indicated on the map. Located on the front and back of the pull-out section; includes your business location on the map. These ads are located inside the back pages of the newspaper; they do not include an indicator on the map. Contact us today to get your ad in our paper. With low rates like these, its easy to connect with your community.